I recently came across an interesting bit of trivia. There are only 13 known models in 18K gold, most of which were shown in catalogs but not all. One of them is identical to another model that was available also in14K gold. The only difference between them is the case material. The 14K model is fairly rare too. It's the 1959 Thin-o-matic T-201. 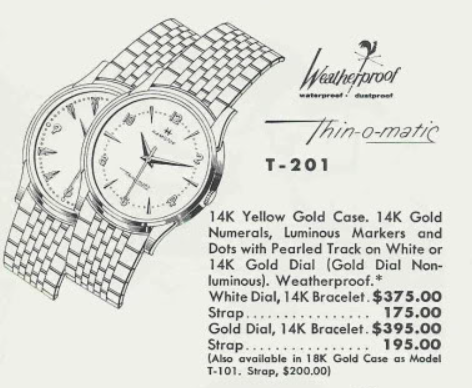 If you look closely at the catalog depiction, you'll see that the T-201 came in a solid 14K gold case and you could get it on a strap or a matching 14K bracelet. You'll also see that it was available in an 18K gold case as the T-101 for an add it also $25.. The T-201 was made for four years. 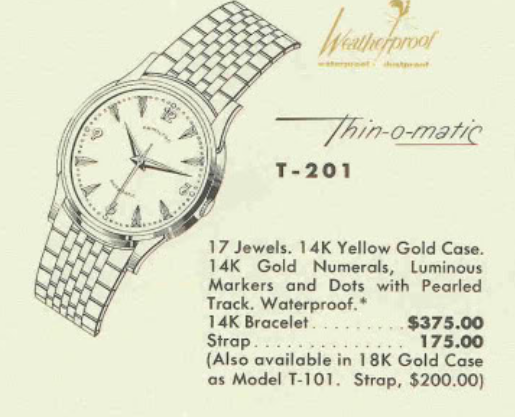 In 1960 the T-201 offered a second dial option, this time in gold and the T-101 was still available. However, you'd have to wait until the 1962 catalog to see the T-101 depicted. A lot of people consider it to be a one-year wonder as a result. It featured the original dial from 1959. So if you happen to see a T-201 for sale you may want to look closely to see if it's actually a T-101. Interesting, huh? Inside a T-201 you will likely find a Hamilton 666 or 663 micro rotor movement. It may depend on the year, although I don't know which one came first or what really makes them different. In the T-101 you might find the Hamilton 691. It's the same movement but with 25 jewels instead of 17. The catalog doesn't make mention of what movements are inside. You don't tend to see the T-201 very frequently and the T-101 is arguably even more rare. You will find "masterpiece" models that are close in design though with a slightly different dial. I recently scored a T-201 and it was in rough shape. The seller had a very generic listing so all I could really go on was the photos and there was no movement shot. I could tell that the dial probably had issues but you never know what you'll until you see it in your hands. I thought the Speidel expansion bracelet was a decent attempt to match the original bracelet shown in the catalog - although I bet it wouldn't come close to a real life example. The case back is a bit worn and although you can't really see it in my photo, the watch has a presentation to someone with almost the same last name as my own. The movement is a little rattly in the case and once I opened it up I could see why. One of the movement case screws is broken off and it's not held inside the case. The movement is very dirty but it does run, which is always a good sign. The inside of the case back has clean signs that the rotor has been rubbing. I suspect that is a result of the missing movement case screw but the rotor was a little loose too. The finish on the dial appears to be compromised. I could try cleaning it but I might lose the printing. What's this? Did the dial magically clean itself? Nope - by coincidence, after I bought the watch I saw a loose movement for sale and it had the exact same dial but in much better shape. The real question is did the seller scrap a $1000 18K T-101 case for $300 in gold or did this movement come from a T-201? Well, regardless at least one Hamilton watch will be restored as a result. My donor has a 663 movement and since it is in slightly better shape I will use it for my project. The reassembled movement is noticeably brighter now and is ticking away with good motion. According to the timer I need to make a slight adjustment to the regulator to speed the watch up a few seconds per day. A new crystal will go a long way toward improving the looks of the finished watch. How's this for a remarkable improvement? This T-201 looks like a brand new watch. I relumed the hands dial so they will glow in the dark again. A fresh lizard strap completes the effect. If the T-201 looks familiar, its probably due to it's timeless styling. In fact, a few years ago Hamilton introduced a throw-back model to the Jazzmaster line called the Jazzmaster Thin-o-matic. At 38mm it's a bit bigger than the T-201 and it also has a date complication. However there's no debate that the similarities are striking. The back of the Jazzmaster is a similar too - but it's not solid gold. I have what I think is a t201, it's 18k any information about it would be appreciated. It's a Kraft foods presentation watch. What do you think it's worth? I also have the inner and outer box for it.